Manchester United have agreed to allow their goalkeeper Ben Williams to stay with the Spireites for a second month's loan. Williams had signed initially on loan as cover for Chesterfield's injured goalkeeper Carl Muggleton. Out with a double stress fracture of the fibula, Muggleton is not expected to be fit for a further few weeks. 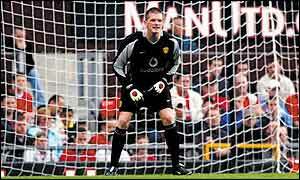 Williams was signed as a trainee by United in 1999 and played for the reserves last season. He has also been on the bench for the first team this season when Fabien Barthez was injured. The youngster has also had a loan spell at Coventry. Links to more Chesterfield stories are at the foot of the page.